The Cybex VR1 Duals Multi-Press is perfect for the facilities which are watching their budget and operate in limited space. The machine includes a Chest Press, Incline Press and Overhead Press in a single package. 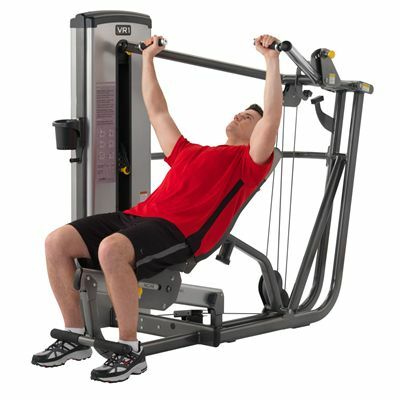 The machine offers simple seat adjustment and provides three position choices for both the overhead and incline press exercises. To ensure the appropriate positioning and range of motion, the pressing arm also includes five starting positions. Additionally, the grips are angled to ensure neutral wrist position which means less stress on the wrist with more comfortable and safer exercising. for submitting product information about Cybex VR1 Duals Multi-Press We aim to answer all questions within 2-3 days. for submitting product information about Cybex VR1 Duals Multi-Press. We aim to answer all questions within 2-3 days. If you provided your name and email address, we will email you as soon as the answer is published. for submitting product review about Cybex VR1 Duals Multi-Press.